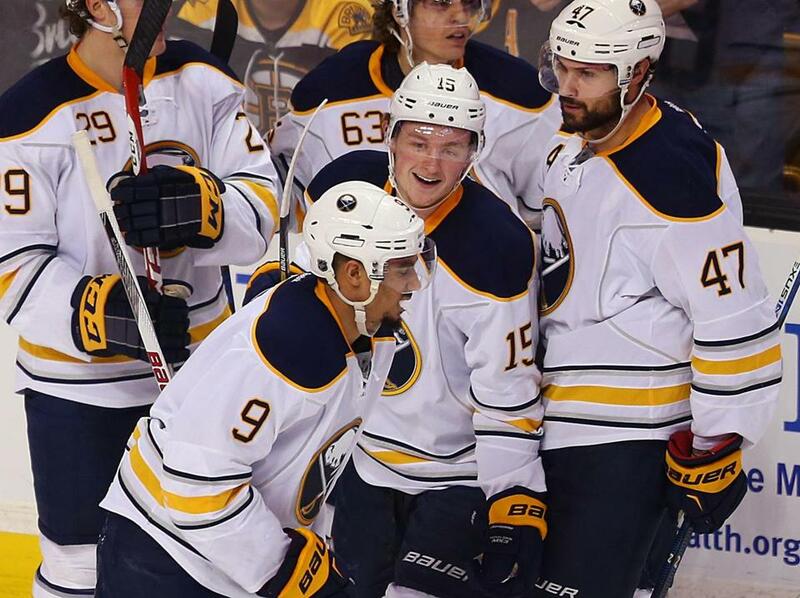 Jack Eichel (15) celebrated with his teammates after the Sabres defeated the Bruins, 6-3, at TD Garden Saturday night. Buffalo Sabres rookie Jack Eichel addressed the gambling story this week that has bubbled around his alma mater, Boston University. The school revealed that junior forward Nick Roberto was under investigation for gambling and had been suspended from the team for the remainder of the 2015-16 season by the NCAA. There have been rumors in the college hockey world that other players on the 2014-15 BU roster also gambled and, in some cases, incurred significant debt. Eichel, who scored two goals in the Sabres’ 6-3 victory over the Bruins Saturday night at TD Garden, handled a question about the gambling story as deftly as he does the puck.